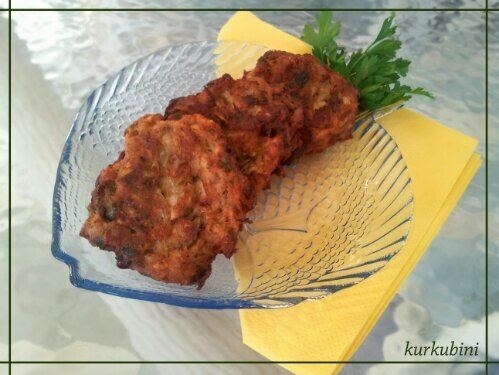 Delicious Zucchini Burgers ~ Κολοκυθοκεφτέδες της Μανούλας Ναυσικάς! Not a fan of zucchini? Well this is the perfect recipe for you! No I am not playing games as this recipe has been adored by people that really love, don’t really care about or hate zucchini! It’s my mum’s recipe and it has become one of her five star side dishes accompanying almost every summer dinner. I personally love zucchini but I have to admit that in this recipe you don’t taste it all. Nevertheless it’s one of my favourite recipes and when we have left overs from dinner I keep eating them as snacks. It’s one of those types of food that you know you can never have cooked too many of them. Even if you have twenty as leftovers it’s guaranteed that they won’t last for more than 20 hours. It’s a relatively easy recipe and the only hassle is the grating of the zucchini. I highly encourage you to try it! We grate the zucchinis and we let them aside for half an hour. We chop the onions and spring onions in small pieces and we sauté them in a pan with two tbsp of olive oil over medium heat. We put them aside and let them cool down. In a bowl we beat the eggs and slowly slowly add the flour until we get a thick yet runny mixture. We squeeze the grated zucchini and add it in the mixture. We continue adding all the ingredients one by one adding salt and pepper at the end. The aim is to end up with a think mixture. If the mixture is runny we add dried breadcrumbs. In a pan we add frying oil and we let it heat up well. When it is ready with a spoon we take some of our mixture, pour it in the oil and fry it without to forgetting to turn them occasionally. Once the first burgers are in the pan we reduce the heat to medium-hot as we want the burgers to be well cooked on the inside without risking burning their outside. Serving suggestion: the zucchini Burgers go perfectly with the Greek traditional tzatziki. You can find the recipe here.